Professional Experience: Admitted to the Utah State Bar in 1978. Practiced as a trial attorney in private practice and as a deputy Salt Lake County Attorney, litigating various civil matters in District Court. Appointed as a Third District Court Commissioner July 1982, hearing and resolving divorce and family-law matters until 1994. Appointed May 1994 as a Third District Court Judge, serving Salt Lake, Tooele, and Summit Counties. Presided over civil and criminal cases. Handled major civil litigation as well as family law matters, and presided over both jury and bench trials. 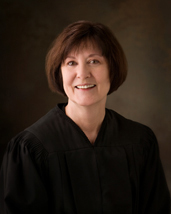 Retired as an active judge January 1, 2012, and served as an active senior judge in Utah State Courts until present. Private mediation January 1, 2012 until present. Education: B.A. University of Southwestern Louisiana, 1968. J.D. University of Baltimore School of Law, 1977. Memberships: Utah State Bar 1978-present. Maryland State Bar 1977-present. Previous service as a member of Children’s Justice Center Advisory Board, Utah State Bar Ethics Advisory Committee, Third District Court representative to the State Board of District Court Judges, and State Commission on Criminal and Juvenile Justice. Past-present and current member of the David K. Watkiss-Sutherland II Inn of Court. Appointments: Associate and Presiding Judge, Third District Court, 2001-007. Current member of the Utah Grand Jury panel of judges. Honors: Award of special recognition from the Utah State Bar for work as a court commissioner, 1992. Woman Lawyer of the Year, 1999. Judge of the Year 2007. Named as a Fellow of the American Bar Foundation.